Version 3 installation already fully supports Prepar3D Version 4. Version 2 (now discontinued) title installers do not and have to be manually added to the Prepar3D V4 Scenery Library. If you have already installed a previously purchased Version 2 area onto your PC for use with FSX then all the files are already on your hard drive go directly to step 1 below. If you just purchased a Version 2 area (countries outside the USA the only remaining titles) and have not yet installed the files onto your hard drive. Go ahead and do that. It will copy all the relevant files onto your hard drive. 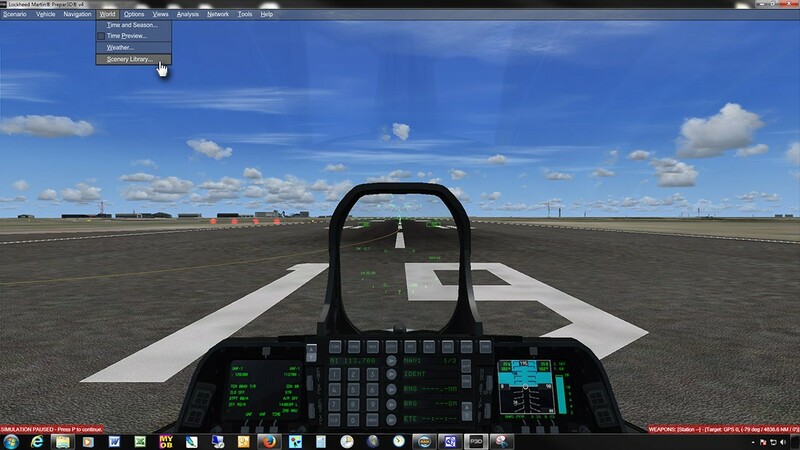 If Prepar3D V4 is the only simulator you have on your PC, at the end of the installation all the simulator boxes (FSX, etc) will be greyed out. That is ok. Just select OK at the end to complete the installation. The important scenery files will be on your hard drive. 2. At the opening screen select OK to commence a flight since the Scenery Library is only accessible from within your flight. 5. Simply Expand The Folders on your hard drive to open up the MegaSceneryEarth folder. All the areas you have installed will have their own folder. MegaSceneryEarth will usually be in C:\MegaSceneryEarth. The C:\ might instead be another drive letter if you have it on a different drive. Then Click On The State Name (in this example it is Delaware). Then click OK.
6. The next screen will look like the screen below. Ensure you select USE THIS SCENERY. Select OK.
7. The next screen will look like the next image with Delaware added to your scenery library. 8. Repeat steps 4 to 7 for all States that you wish to add. 10. Prepar3D Version 4 will then update its scenery databases and then return to the flight you are in. 11. MegaSceneryEarth V2 will now be available in Prepar3D Version 4. 12. Simply go to any airport in the state that you have just added and MegaSceneryEarth will appear as your scenery.